Game Preview: Bears at Monsters, 7:05 p.m.
03/23/2019 - The Hershey Bears kickoff back-to-back games against the Cleveland Monsters, American Hockey League affiliate of the Columbus Blue Jackets. 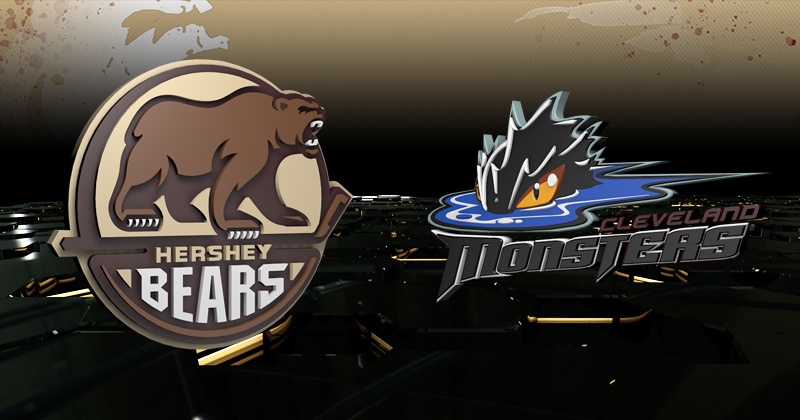 Both teams split a two game set at Giant Center earlier this season, with the Bears blowing out the Monsters, 6-1 on Nov. 16, before dropping a 5-2 decision the next night. RADIO: WQIC-100.1 FM, WOYK 1350-AM, Fox Sports 1460-AM, Voice of the Bears Zack Fisch on the call. The Hershey Bears continued their winning ways with a 1-0 overtime win over the Wilkes-Barre/Scranton Penguins at Giant Center. Garrett Pilon scored the game-winner at 1:14 of the sudden-death with a snap shot over the glove hand of Pens goaltender Tristan Jarry. Vitek Vanecek turned aside all 17 shots for his ninth career American Hockey League shutout, and second during the 2018-19 season. The win extended Hershey's current point streak to seven games. The Cleveland Monsters scored twice on the power play last night to top the Rochester Americans, 5-2. Derek Barach, Zac Dalpe, Alexandre Texier, Mark Letestu and Justin Scott scored for the Monsters. Tonight will mark Hershey's first visit in Cleveland since falling in the 2016 Calder Cup Finals to the then, Lake Erie Monsters. The Bears appeared in their 23rd Calder Cup Finals in franchise history, and were swept by the Monsters in four games, with the dagger occurring on June 11, 2016. Games 3 and 4 both occurred at Quicken Loans Arena, and Hershey lost both games in overtime by scores of 3-2 and 1-0. Tyler Lewington, Nathan Walker, Riley Barber, Liam O'Brien and Aaron Ness are the five remaining players on the Bears roster from the 2016 Calder Cup Finals. Bears forward Mike Sgarbossa returns to Cleveland representing the Chocolate and White after spending parts of three season with the Monsters. Quicken Loans Arena marks the scene where Sgarbossa made his American Hockey League debut on Oct. 12, 2012 against the Oklahoma City Barons. In 146 games with the Monsters from 2012-2015, Sgarbossa tallied 28 goals, 59 assists for 87 points and represented Lake Erie in the 2013 AHL All-Star Classic. Hershey forward Riley Barber scored twice in last Saturday’s win to give him a league-leading 31 goals this season. Barber has enjoyed great chemistry with linemate Mike Sgarbossa all season. Sgarbossa has assisted on 17 of Barber’s goals this year, with 12 helpers being the primary assist. Sgarbossa and Barber each have a career-high 58 points on the season, a mark good for fifth in the AHL’s scoring race. Forward Garrett Pilon enters the week with goals in three straight contests. The rookie forward started out of the gate slow, tallying 11 points (two goals, nine assists) in 34 games in 2018, but has turned on his scoring touch since the calendar flipped to 2019, gathering 19 points (eight goals, 11 assists) in 31 games. He leads Bears rookies with 30 points.